Spring is here and its the time to be outside! We love spending time outdoors especially in our backyard. Each Spring I pull out our patio cushions and extra decor. This year I realized I was due for a patio refresh. 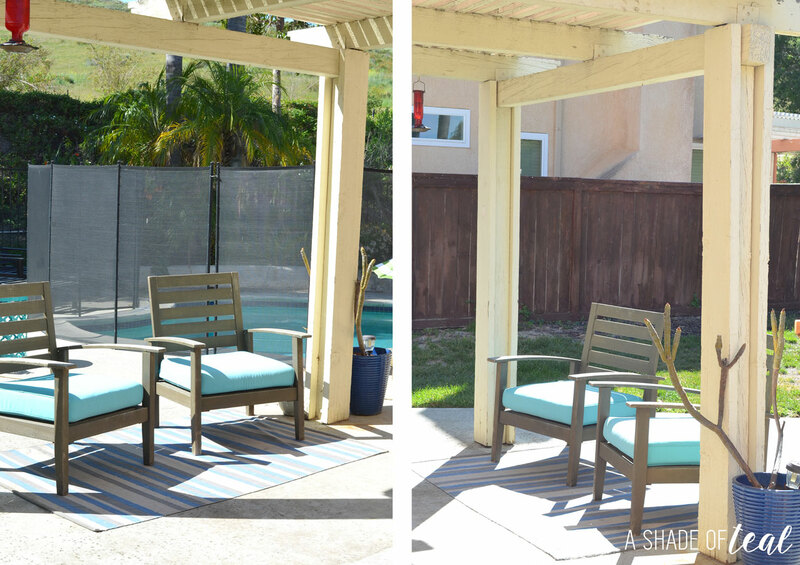 We have some big plans for our backyard but for now I’m starting with a mini refresh. 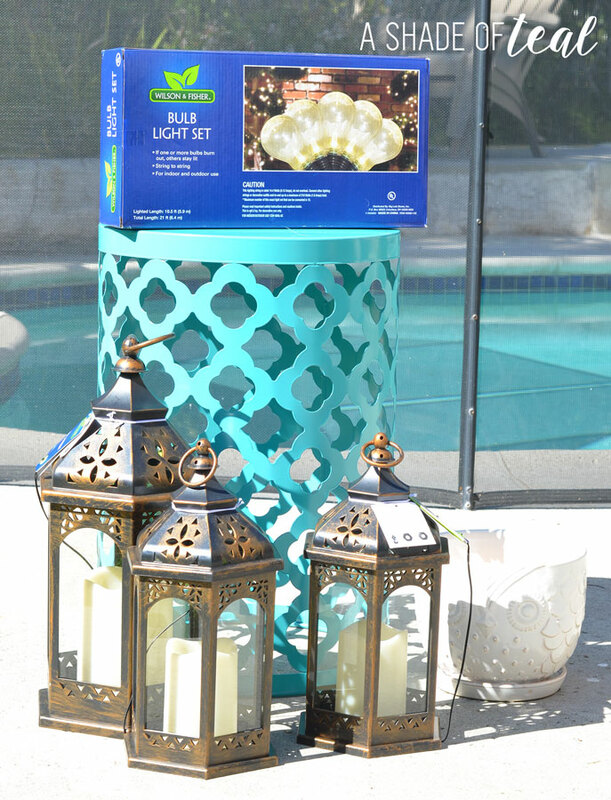 I was recently at Big Lots and became inspired with all their outdoor decor; especially the outdoor lighting. I love the lantern options they had along with their string light’s, please keep in mind styles and assortment vary by store. I had to pick those items up with the idea of making a centerpiece. 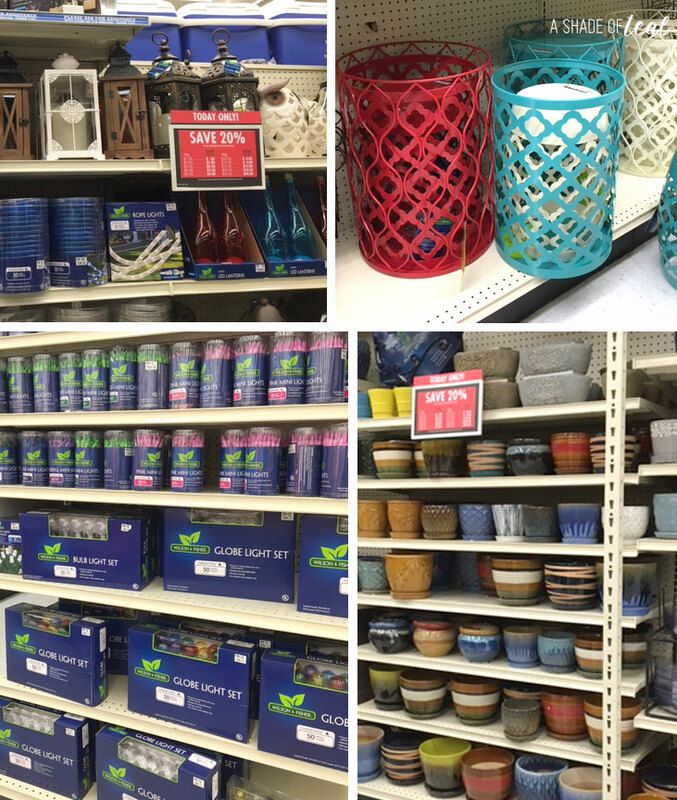 Big Lots also carries so many great outdoor options for your home. 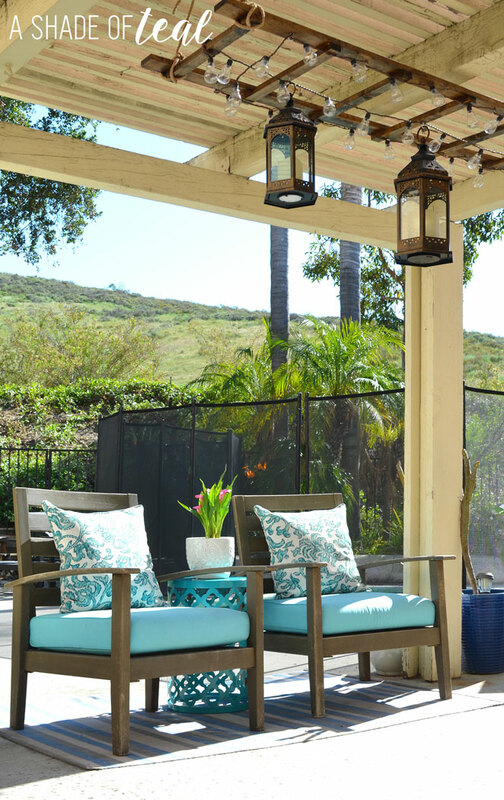 They have some amazing patio furniture sets, gazebos, and all the outdoor accessories you’ll need! I also picked up a new garden stool and white owl flower pot. Here’s the before pictures of the space I wanted to give a refresh. We eventually plan to build a new pergola and add a outdoor dining table among several other projects we have planned for our landscape. 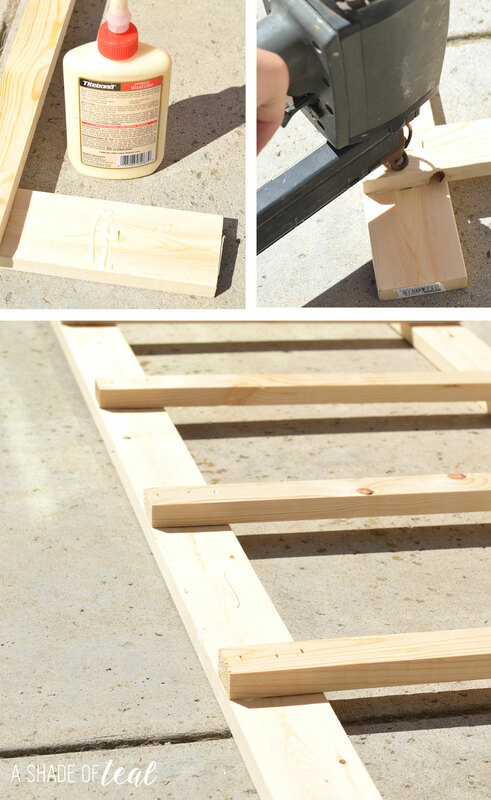 To get started on making the ladder light centerpiece you’ll need the following. Start off with making the cuts to your lumber. Then lay the pieces together to see how the ladder will be constructed. Next, nail and glue the wood together. 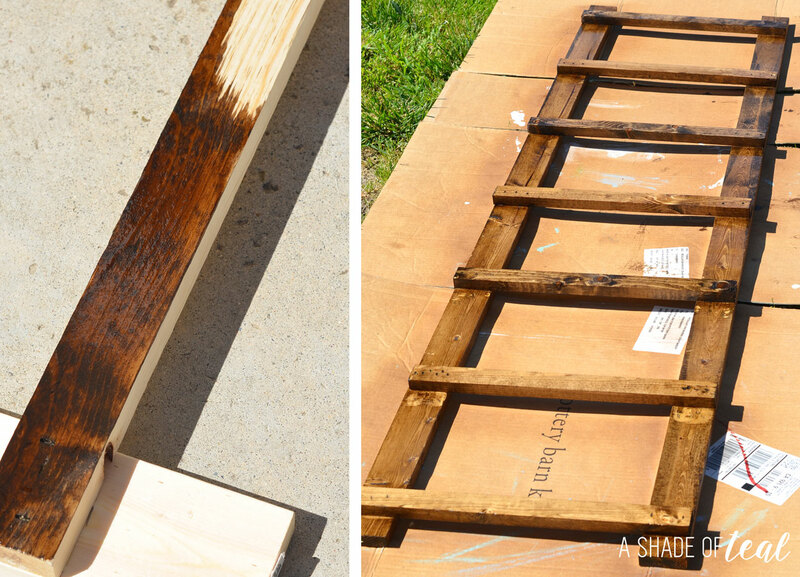 Once the glue was dry I started staining the ladder. I also topped it off with a coat of poly to seal the wood & stain since it would be outdoors. Once everything was dry I added these screw-in-hooks for the string lights and lanterns. I also added some rope to the ends on both sides. 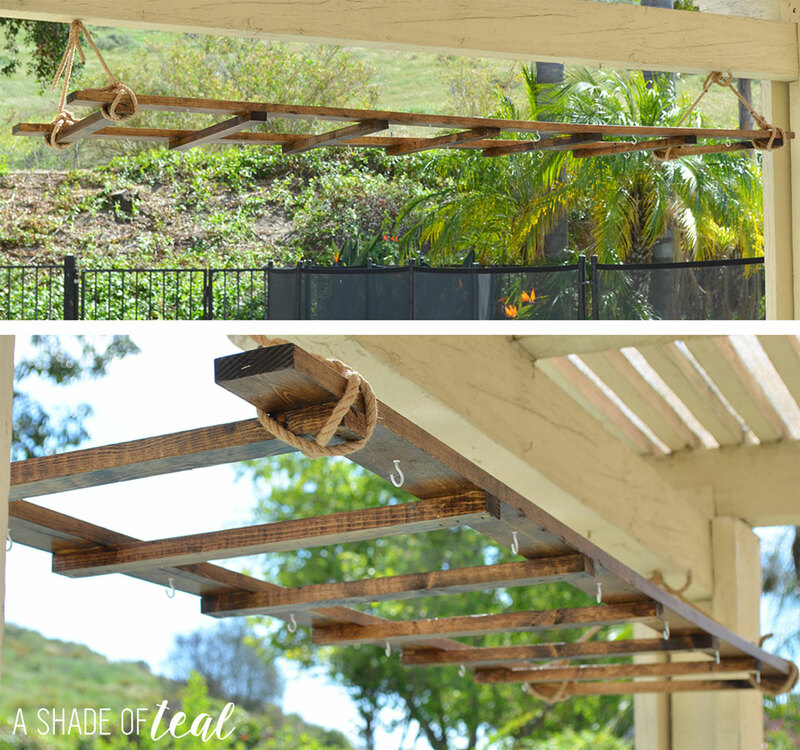 I then used more screw hooks on my pergola for the ladder to hang off of. Once the hooks are secure you can hang up the ladder. Now the final step is to decorate! I added the string lights and the lanterns. I also added my new decor to freshen up my patio space. Here’s the ladder light centerpiece at night. I love the ambiance it gives off. We eventually plan to add a outdoor dining table that will sit under the centerpiece. But for now I absolutely love how it all came together. Have you visited Big Lots lately? I love how their store is so easy to navigate and the outdoor section is so large right now; there’s so much great product to choose from. I would love to hear what you found at your local store. Wow, that is absolutely amazing! I LOVE how it came out. Awesome job! I love the hanging ladder! Pinned! This is beautiful! I love the whole look and am so eager for it to warm up here so I can start decorating and enjoying my outdoor area again! Wow. That is just beautiful. It illuminates your whole back yard or front porch. Well done! I love this post because it has my favorite color turquoise and it has all my other favorite things like the hanging lights and lanterns. How incredibly creative, everything really tied in together perfectly. I sometimes wish I had a creative side but then I see tutorials like this and think their may be some hope for me after all. 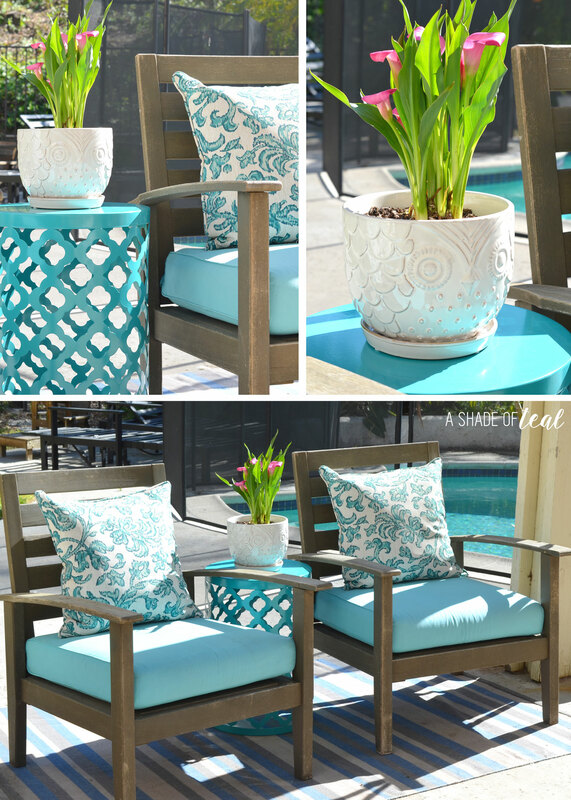 The end result is fab and I adore the splashes of teal and the lights are cute too ! That’s really awesome! I hope I can pull that off. It looks lovely and the place looks a little more romantic and relaxing. Thanks for the wicked cool idea! Im always scared of DIY, but this one seems pretty easy, id like to have one at home! i love how the bulbs look! Thanks Amy, it was really easy! You created a very inviting space. Love the hanging ladder. That ladder light centerpiece is SO pretty! love this idea! This is so super creative and awesome! I love the concept and the finished product!! 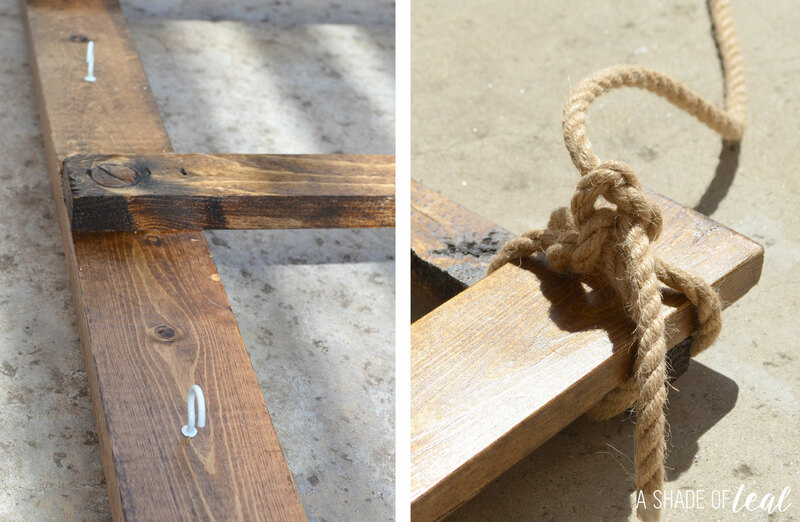 Amazing DIY project to try ! Love the final result! Looks kind of easy! Thanks Ana! It was a super easy DIY! Haha! Its easy to make so hopefully he’ll do it! 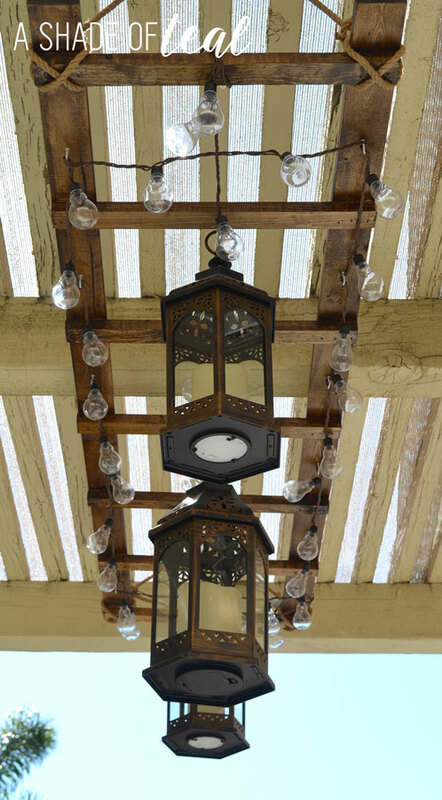 I love the look of your outdoor light fixture, especially when it’s lit up at night! I wish we had a covered area over our deck…I would definitely love to make something like this for it! 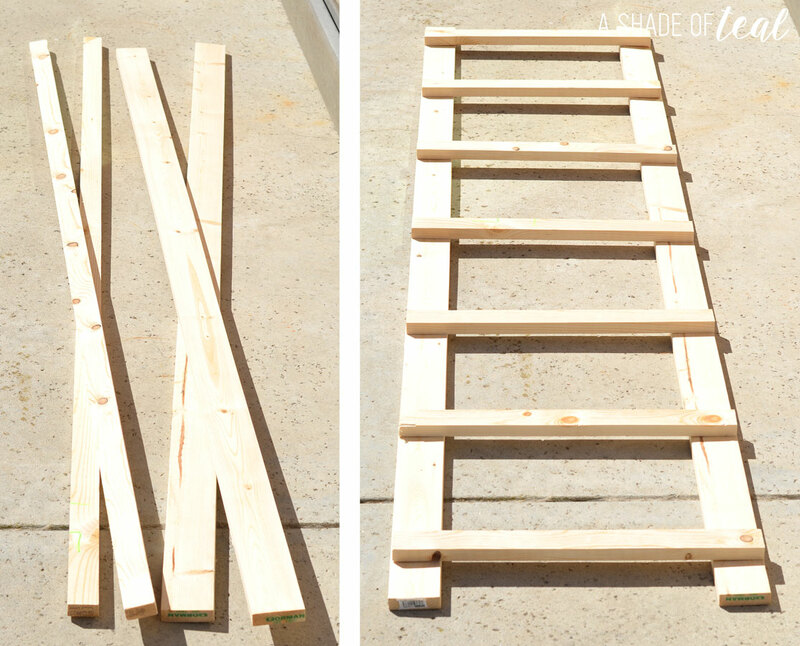 I LOVE this ladder – and it looks so easy to make! It updates your space so beautifully, and now it looks so easy to hang lights. Awesome project! This is simply amazing. I love this. Great DIY project. I might do something like this too, soon! What a great idea! And absolutely love the colors that you picked. Wow. That is sooo beautiful! It illuminates your whole porch! I am using our idea on our deck! Wow. That is a very nice transformation! 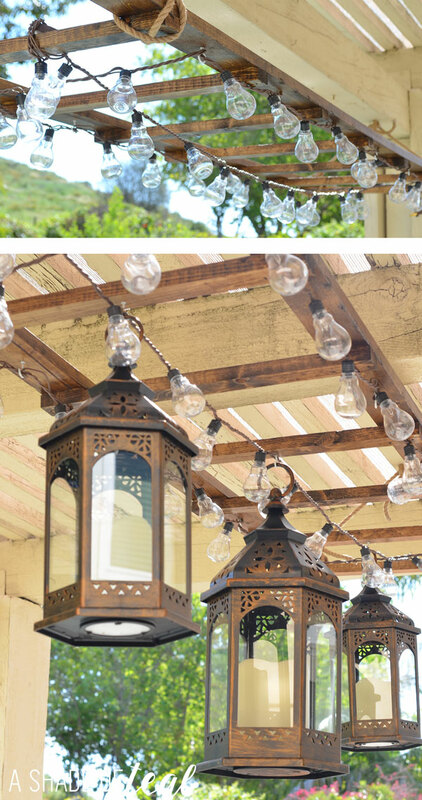 Such a creative way to add ambience to your patio area! 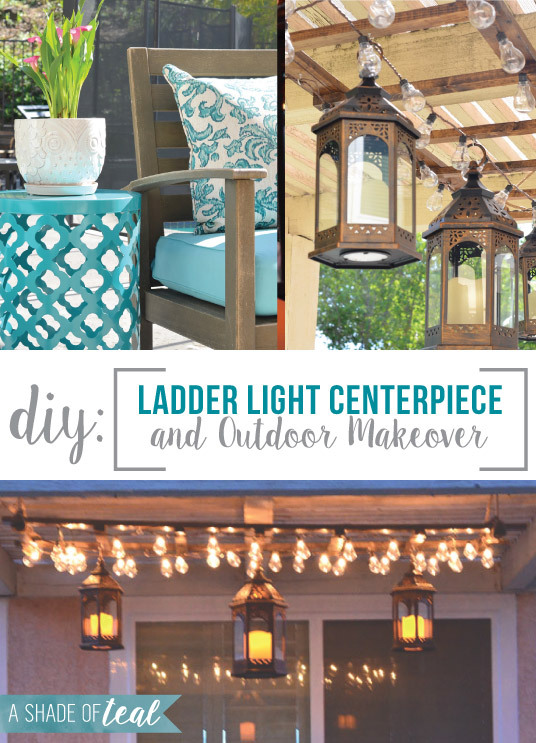 I love how you added the lights to the ladder and your tutorial is good for even a power tool newbie like me! Love the ladder you created for your Edison lights Katy! Looks awesome and so does your patio!!! to be able to fit 10 people around it like you did. You can tell me the size of your table? Thank you for the inspiration and all of your links for the chairs and the DIY table.